And oh man… I did just go off on a tangent talking about that story, but realised that’s completely not the point of this post, and have removed those off-the-rails paragraphs. 😛 Maybe I’ll talk about the story in future, if anyone cares (almost no-one cared back in school, so hey, I ain’t holding my breath now 😛 ). The story comes next, but if you’d prefer, I have it as a PDF, complete with a cover page. Feel free to grab it here! Those words stayed with me for hours. I shook my head and blinked a few times to force myself out of my thoughts and back into reality. I found myself sat by a campfire with a few of the other dragons, while beautiful trees and foliage of the forest surrounded us on all sides. To my left was Thunder, a Great Dragon, his bright yellow scales gently crackling with energy as always. Opposite me was Shadow, a Western Dragon like myself, as black as night, and with sharp, crimson eyes that could easily pierce the darkness. And to my right was the owner of the voice I had heard: Ifri, a smaller breed of dragon known as a Drake, his personality still as vibrant as the bright red scales covering his body. A short growl emanated from Thunder’s throat as that question was asked. “Oh. Ohhhh.” Ifri said, seemingly realising something I didn’t. “What?” I asked, frowning slightly. 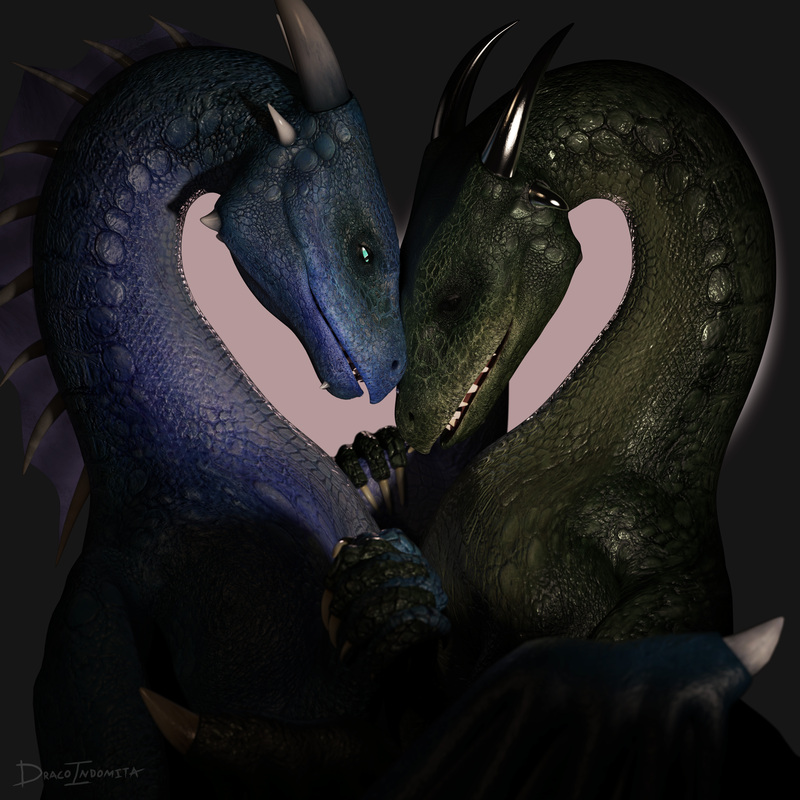 Shadow quickly and forcefully cut Ifri off mid-sentence, clasping his claw firmly around the drake’s muzzle. Ifri tried to loosen Shadow’s grip and voice his disapproval, but all he could manage was a few muffled cries of protest. I nodded, letting out a short growl of appreciation before heading to our nearby cave. Etched into the cliffside, and tunnelling surprisingly far beneath the surface, it was a very impressive cavern with more than enough space to shelter all six of us. Tonight, however, with Thunder, Ifri and Shadow socialising outside and Shikaru out hunting, only one person was in here. Emerald… my mate. Words can’t convey how much I cared for her. Our matehood was proof of that. Dragons only enter matehood with those they truly, truly love, because when a dragon chooses a mate, that bond lasts for the rest of their life. But for me… I loved her so much, that I would have been happy to journey into the afterlife with her still by my side. Ever since the Battle of Eache Grak, though… we had been apart. I didn’t even know if she was alive, and I feared that I had lost her forever. This fear left me feeling… lost, and empty, and as a result, I slowly began to lose my will to fight. However, as the years passed, fortune began to smile upon me. I was able to meet up with some old friends and allies, and even make new ones at the same time. This gave me hope. Hope that I would one day find her. And then… finally. After 22 long years, I got the lead I was praying for. One that led me to my mate, alive and well. Knowing that she was safe… knowing that the children that she had spent all that time raising on her own were safe… it reignited that flame inside me. It gave me a reason to keep fighting. I wanted to fight for Guira’s future… and in turn, I wanted to fight for the future of my loved ones. I wasn’t going to let anyone, human or dragon, stand in the way of that future. But today… I was afraid. Emerald was my drive, my reason to fight, but the way she acted today gave me the frightening thought that she was unhappy with me. What was she going to do? What was she going to say? D-did she… intend to rescind our matehood…?! I stopped walking, shivering at that thought. Gods, no… no, no, that would… it would rip me apart. The thought shook me so much that I instinctively lowered my head and closed my eyes, giving a silent prayer for the contrary. A few moments later, I continued through the cave, soon reaching the passageway that led to our chamber. As the gentle pattering of my footsteps echoed throughout the hall, my heartbeat hastened, and I felt my wings start to tremble with nerves. Gods, I couldn’t go in like this. I stopped again for a moment, taking a deep breath to steel myself for what was to come. Then, when I felt I was ready, I bravely stepped forward, and turned the last corner. That word escaped my maw before I could hold it back. In the chamber, with only candlelight to illuminate her stunning, scintillating green scales, Emerald was lying there, a mesmerising sight to behold. As she saw me enter the chamber, she gently blew a ring of smoke in my direction… in the shape of a heart. “Evening, Sin.” She said, with a smile. That smile told me everything. That serious, stern look I saw on her muzzle earlier in the day was nothing more than a ruse. She did all that to hide this surprise she had in store for me. Immediately, I felt that huge, heavy weight that had been with me all day lift from my shoulders… and with no words to respond with, all I could do was laugh, turn to the wall next to me, and press the top of my head into it. “Heh, what’s wrong? Was this a bit much of a surprise?” She asked, with a chuckle of her own. I turned from the wall, and began to approach her, my laughter slowly dying down. Emerald laughed, shaking her head slowly in response. Emerald raised her head to mine as I got close, allowing me to nuzzle her, lovingly. She responded with a soft, affectionate purr, each time our muzzles stroked against each other. We stayed like this for a few tender moments, until I found it impossible to hold back the one question that was on my mind. “Don’t you know what day it is today, Sin?” She asked, simply. I furrowed by brow, and thought for a moment. The days seemed to fly by, recently, so I often had trouble keeping up. But… as far as I was aware, today wasn’t a particularly special day. It wasn’t the anniversary of our matehood… right? Had I forgotten something? “You dunce, Sin. It’s Kainakdia (Friday).” She chuckled. “Ah, heh. I… I clearly don’t know, then. Sorry…” I replied, blushing. I tilted my head, puzzled. Before I could open my muzzle to ask her, she brought her lips to mine, and kissed me, gently. “Arasi Franaie’dianas, mis amai.” She whispered. “You’ve remembered?” She said, with a smile. Franaie’dianas… of course. “Franaie Day” in Standard, it was one of the ten days of the year dedicated to each of the different Draconic Gods. Each of the Gods governed one of the ten elements, but they also governed two attributes each. On each of these ten days of celebration, those attributes were the focus of the festivities. 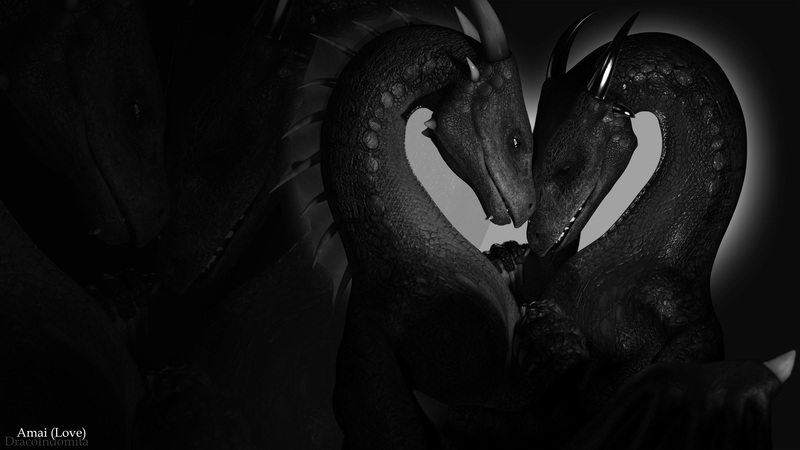 This time, it was the day dragons honoured Franaie, the Goddess of Fire, and her attributes of love and confidence. 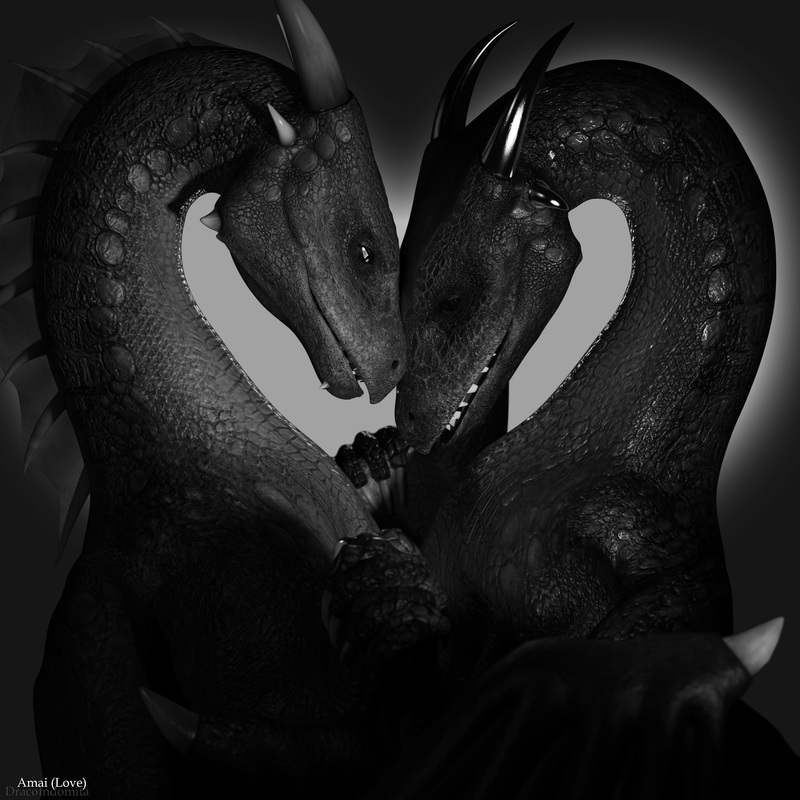 On this day, dragons often cast aside shyness and fear to confess their love towards one they had feelings for, and those already in a matehood or partnership would express and affirm their love without worry or inhibition. And this scene… was Emerald’s way of expressing her love to me. “Can you really blame me?” She said, defensively, but with a light-hearted tone. I looked down, finally taking a breath. There I went again. My feelings for her gushing from my maw, with no way of stopping them. But before I could apologise, I felt Emerald embrace me, tightly, a few tears running down her muzzle. She wanted to finish that sentence, but all her emotions allowed her to do was cry with joy. I let out a gentle chuckle, quietly putting my arms around her. There it was… that wild telepathy of hers. She had managed to tame it in the years we were apart, but she always seemed to lose control of it when she got emotional. It was cute. She managed a quiet laugh through her tears, and I smiled. “Hah, says the dragon who forgot about it…” She retorted, with a laugh. She smiled, closing her eyes as I nuzzled her, lovingly. As I took hold of her claw in my right, and gently ran my left claw along the side of her muzzle, I whispered. Okay, let’s see, where should I start? Let’s start with the story, shall we? I can’t think of much else to write about the writing. 😛 So let’s move on to the stuff I’d written before, regarding the render. AHHH! Go up there and look at them again! JUST LOOK AT THEM! LOOK AT ALL THE LOVE! THERE’S SO MUCH OF IT! Damn! This render was so much different from what I normally do. It was partially inspired by “Shh… it’ll be okay…“, a very old (and not very good, but hey, gotta start somewhere 😛 ) render I created when I was just getting started with DAZ Studio. Whereas that was a more solemn scene with a hint of love, this one is total love. And damn. I really enjoyed doing it, and really, really love the result. 😀 Aaand that was big-headed and vain. Slap time! Despite its apparent simplicity, this render was actually quite tricky! Sure, I knew exactly what I wanted when I began: I wanted them very close to each other, I wanted their necks to bend in such a way that they made the shape of a heart, and I wanted them to be nuzzling. However, after about half an hour or so of posing, I finally realised that achieving all of the above was impossible if the dragons were in a quadrupedal posture. 😛 Besides, I then thought more carefully about it, and realised that they wouldn’t be able to do some other nice things in a quadrupedal posture, like hold each others’ claws.